This menu item pastes Windows hard links to the files currently on the clipboard, into the current folder as shown in the files pane. The files would have been placed on the clipboard by Copy or Cut. If Cut was used, then pasting shortcuts does not delete the original file, as with Paste. Note that folders cannot have hard links. Hard links are a feature of the NTFS file system (ie. not available on FAT16 or FAT32 drives) which allows creation of virtual files which point to a true file. Multiple virtual files may point to the same file, with each behaving as though it were the true file. 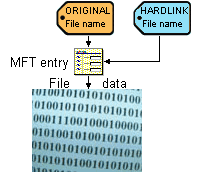 The hard link points to the MFT (Master File Table) entry for the true file and propagates changes to the entry (except for the file name) to all other hard links pointing to the same file. The following diagram may explain this concept better, but may not be completely accurate in its representation of the MFT entry or file structure. In the diagram, the original name points to (and accesses) an MFT entry which contains all file attributes (timestamps, read-only flag, etc.) and in turn points to the actual file data. When the hard link is created, it points to the same MFT entry, but could have a different name. The Explorer++ function - Paste Hard Link - always creates the hard link with the original file name; obviously, then it cannot be created in the original folder or else a naming conflict will exist. Since the original name and hard link name use the same MFT entry, etc., changes to either file result in changes to the true file data and attributes; the newly created hard link file is essentially a true file! To remove a hard link, deleting either file name has the same effect; the remaining (single) link becomes the true file. In Windows, the NTFS file system counts the original name as hard link #1 and the additional hard link as #2; all normal files, then would have a hard link count of 1. The file system tracks the hard link count for each file at all times; when the count becomes 0, then the file data area is considered free space and may be reclaimed. It is interesting to note, therefore, that when a file is deleted (to the Recycle Bin), it would still have a count of 1 since only the name (and MFT entry?) have been removed. It is not until the Recycle Bin is emptied that the file is completely deleted, assuming its hard link count was 1, ie. no additional hard links to the file exist. Hard links may only be created for files on the same volume (ie. the same drive letter); attempting to paste a hard link to a file on a different volume results in a true copy of the file. Explorer++ can view the hard link count by enabling Hard links as a column heading in the files pane. If you use hard links frequently, you might consider a useful freeware tool - Link Shell Extension - which can manage hard links. When installed, it (among other things) creates an additional property sheet which allow enumeration (ie. location) of any additional hard links to a file, something that Windows can’t do! Hard links may also be created by the Windows command line tool Fsutil (Windows XP) or Mklink (Windows Vista or later).